An inspirational, informative and energising two-day workshop designed to recharge your creativity and give you the tools and confidence to consistently win more of the right work. Discover how to show your clients the value in what you do, elevate your offering and unleash the potential within your business. Update: This workshop is now sold out. Running a creative business is quite possibly one of the most rewarding ways to make a living. You get to create a sustainable, profitable, successful business around doing what you love on a daily basis. You get to call the shots. To work with clients who truly value what you do and will give you the creative freedom to your very best work. At the very heart of this trust, freedom and sustainability, lies your creative flair. You need to find the magic within your work and treasure it. You need to be able to articulate and communicate why your clients should pick you over anyone else. And as a creative entrepreneur, it’s not your customer service, your professionalism or your quick turnarounds. It’s your creative style. Even the most accomplished of us can lose track of this over time. This is your opportunity to take stock, regroup and move forwards with clarity and confidence. This workshop will help you rediscover the magic in your work. It’ll enable you to clarify your aesthetic and really nail down who you want to be working with. Most importantly, it will give you the tools and confidence to win more of the right projects, building a truly solid business foundation in the process and and put joy at the very heart of your work. A series of hands-on practical exercises designed to inspire you and enable to get you to the heart of what makes your work uniquely brilliant. By the end of the day you will have defined your creative style and have a clear sense of what sets you apart. You’ll leave with a curated portfolio that potential clients can spot at fifty paces. A mix of practical exercises and informative sessions designed to give you the tools and confidence to start winning the right work the moment you get back to your desk. You’ll be clear about what’s undermining your credibility and what’s needed to realise your ambition. We’ll explore the specific tools you can use to dazzle potential clients with your brilliance, captivate them with your expertise and galvanise those that are the right fit to see your business as the only logical choice for them. Finding the clarity and confidence in your unique creative style is at the very heart of this workshop. You'll leave with a freshly curated, cohesive and compelling portfolio your clients can spot a mile off. You'll be able to properly articulate what your style is, what it isn't, and you'll know precisely the kinds of clients you want to work with and those to walk away from. Inspiration is the lifeblood of every creative business. This workshop will supercharge your inspiration, feed your creativity and open the door to what's truly possible within your work. 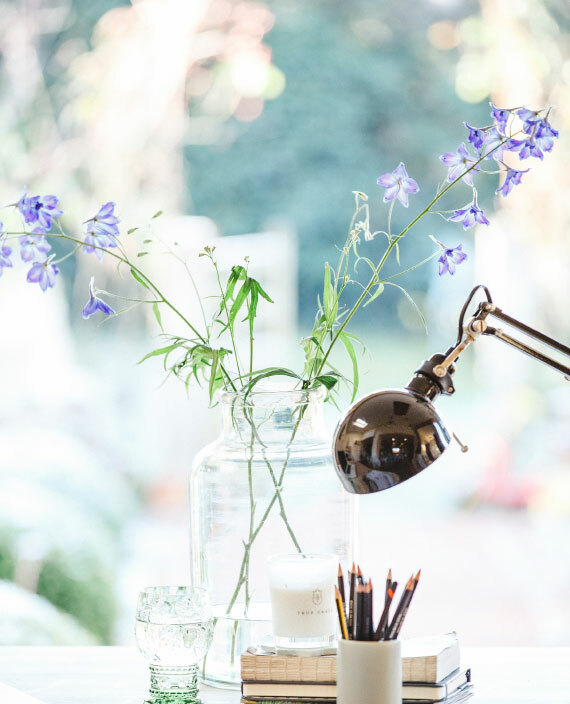 You'll be inspired by the light-filled setting, the beautiful gardens and the incredible food, but most importantly, this workshop has been designed to empower you to put your own creative flair at the very heart of what you do. And that will have quite a magical effect on your business. You'll leave our two days together with the confidence to go for the work you know you're really capable of and with the tools to make your company an absolute no brainer for the clients who are the right fit. Together we'll explore the specific tools you can use to create momentum for your business, captivate your clients and raise your game. The Fig House at Middleton Lodge is set in a magnificent 200-acre private country estate in North Yorkshire. We spent my husband’s 40th birthday weekend here and I was absolutely enchanted: with the food, the architecture, the gardens, the service and the spa. As soon as we saw The Fig House, I just knew I needed to hold an event here. With gardens designed by Tom Stuart-Smith, food to die for and an utterly magical atmosphere, you’re in for a real treat. And if you’re visiting from further afield, Yorkshire is a beautiful county that’s worth an extra few days’ exploration. They don’t call it Gods’ Own Country for nothing. Middleton Lodge is around 10 minutes from Scotch Corner on the A1 or a short taxi ride from Darlington Station where trains to London take around two and a half hours. Leeds-Bradford and Newcastle airports are easily accessible too. To join us for this inspirational, informative and energising workshop, please book your place below. Your investment includes all course materials, a creative and intensive two-day workshop with Fiona Humberstone, The Brand Stylist, as well as and delicious lunches on both days and cocktails to finish. You are going to love it! what are the terms of booking? We’re so excited to welcome you to the workshop! Please do read the following carefully because by booking your place, you agree to the workshop terms and conditions. As you know, Brand Stylist events are incredible, inspirational and highly sought-after and often sell out very quickly. It’s important to us that when you book, you’re serious about taking up your place. Because if you’re not, that prevents someone else experiencing the magic, which doesn’t feel very fair. We have a very strict and transparent cancellation policy. We do understand that very, very occasionally you may need to cancel your place. If you cancel within one month of the workshop, you will incur a 100% charge and your payment will not be refunded. You may send someone else in your place if you choose to. You must let us know who you will be sending at the time of cancellation. Whilst we often keep a waiting list, we will not refund your course fee if you are unable to attend: even if we fill the place. It’s essential you are committed to attending this workshop and that you only sign up with this commitment in mind. All course material, workshop content and marketing literature is protected copyright. What that means in simple terms is that you may not copy it, reproduce it or share without prior written permission. Should you choose to pay in instalments, it’s down to you to make a note of payment dates and to be sure you have adequate funds in your account to cover the transfer. HOW DO I GET TO THE FIG HOUSE AT MIDDLETON LODGE? Middleton Lodge is just ten minutes from Scotch Corner on the A1, so the easiest way is probably to drive. There’s plenty of free parking onsite. Darlington train station is a fifteen minute taxi ride from the hotel. Trains run regularly from central London – it’s around two and a half an hours from the city. Durham Tees airport is twenty minutes away and Newcastle International Airport also around an hour away, so it’s very possible to attend from overseas with a little planning. CAN I STAY AT MIDDLETON LODGE? It’s a really beautiful place and I highly recommend you book a room to experience the magic. There are also a handful of budget hotels around the Scotch Corner junction and the local town of Richmond a fifteen minute drive away. Please note that accommodation is not included in the cost of the workshop. I LIVE NEARBY, DO I NEED TO STAY? Not at all. Workshop sessions run between 9.30am and 4.30pm where we’ll spill into the well-stocked bar for a celebratory cocktail. There is absolutely no obligation to join us outside of these hours so if you’d prefer to stay at home, or with family and friends, that will work really well.